Nearly 962 million people around the world are 60 years old or older, which represent 13% of the world population. This phenomenon has a growth rate of 3% annually and according to estimates, by 2030 the number of elderly people will reach to nearly 1400 million people. In Latin America and the Caribbean, the situation differs in comparison with other regions. While in Europe the number of elderly reaches 24% of the population, according to the UN, in Latin America and the Caribbean this percentage reaches only 11% of the population. The numbers are substantially low if also compared to other regions: in North America, the elderly represent 21% of the population while in East Asia and Oceania this number reaches 16%. However, the situation in Latin America is expected to change drastically in the upcoming years: it is projected that by 2050 the number of people over 60 years would be 24% which is similar to current number seen in Europe. The effects of global ageing extend far beyond mere demographic data and some of the most important repercussions are related to health care, especially in the public sector. Data demonstrates a progressive increase of people with chronic diseases and other conditions that in most cases, necessitates special care, which in the long term, has an impact on fiscal budgets. In this context, it is necessary to initiate a joint work that integrates all health actors, both locally and globally, aimed at the development of coordinated actions to strengthen health systems. However, efforts should also be focused on prevention, encouraging lifestyles that may prevent diseases. Actions focused on addressing the ageing phenomenon must encompass also a change in the language that is normally used on the topic. In this sense, instead of perpetuating the idea of ageing as a synonym for deterioration, it should be promoted an approach that uses concepts like “life course” or “life trajectory”. The concept of life course ensures a new perspective and therefore, new opportunities for the elderly for a future with optimal well-being. Thus, the idea of a Positive Ageing, intends to promote a new mindset of a person throughout his life, from gestation to adulthood that in the long term, will assure a healthy, participatory and safe ageing that respects and promotes human rights of the elderly. The phenomenon of population ageing also plays an important role in the context of the achievement of the SGD’s. Among them, the most important ones are SDG 3, related to ensuring healthy lives and promoting well-being for all at all ages; SDG 10 on reducing income inequality within and among countries, promoting social, economic and political integration of people, regardless of their age, and; SDG 11 about making cities and human settlements inclusive, safe, resilient, and sustainable. Thus, the associated challenges in the phenomenon of the ageing population require an integrated approach that involves a set of health actors, from local to international level. Otherwise, if efforts are not put into practice in a systematic and coordinated way, the full achievement of the Sustainable Development Goals will be at stake. 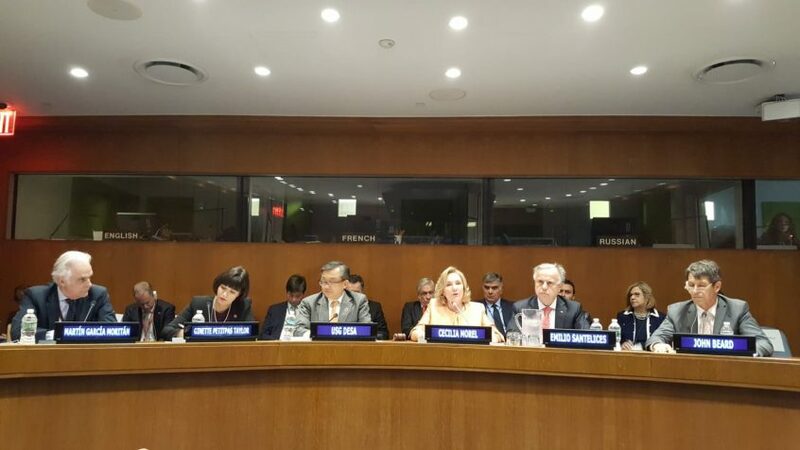 UNDESA co-sponsored an event on 27 September at UN Headquarters in New York on the “Alliance for a Positive and Healthy Ageing and the Achievement of Sustainable Development Goals”. 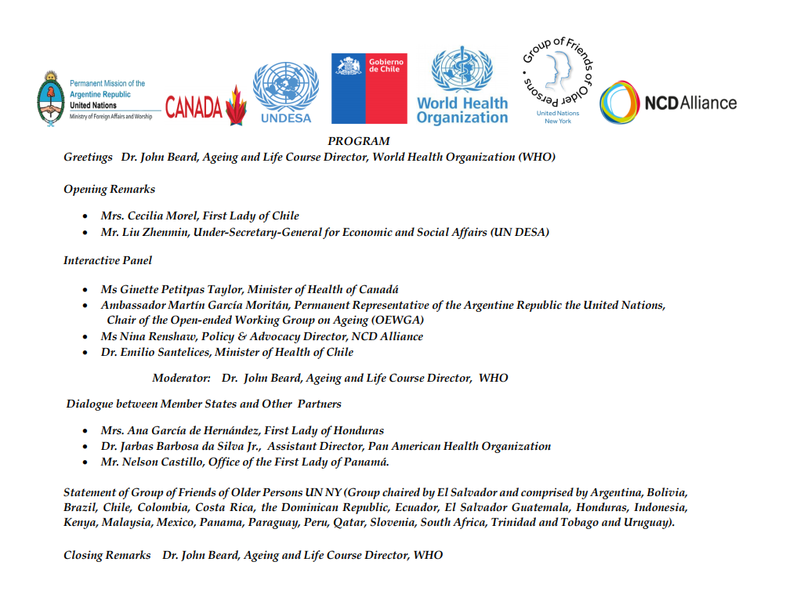 The event was held by the President of the Republic of Chile H.E. 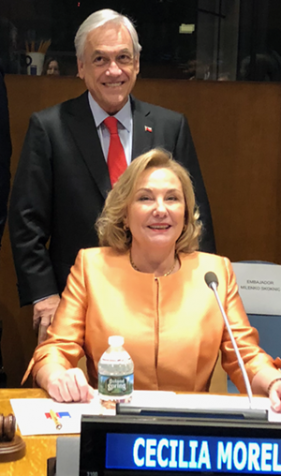 Sebastian Pinera and the First Lady Mrs. Cecilia Morel during the High-level week of the 73rd session of the General Assembly.